Moon Over Edisto is a most enjoyable book and was hard for me to put down. 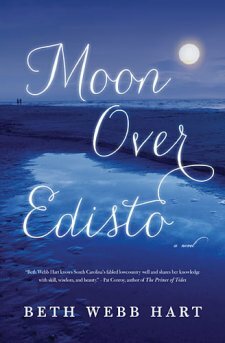 I enjoyed how Edisto Island and the type of life there is beautifully portrayed. The author's style is easy to read. and I was immediately hooked. I fell in love with Julia and her kind heart as she reconnects to her past and returns to South Carolina. The setting adds so much to the story, and the author perfectly captures this southern island. I love the way the author shows the transition of a family torn apart by divorce coming back together in love in a time of need. Overcoming a dysfunctional family life, Julia is both inspiring and courageous. The resolution under the low-hanging Edisto moon makes a beautiful ending. I highly recommend this to anyone wanting a really good read.